•If your river network is simply a collection of polylines with nothing more than a unique ID number for each polyline then you must build the From-node and To-node fields. Do not assume existing node ID's are correct; you should always use the node ID's generated by RivEX as this guarantees correct identification in a manner that RivEX will understand. •When building the nodes for the first time, the only option available to you for the node fields is *** ? *** as shown below. 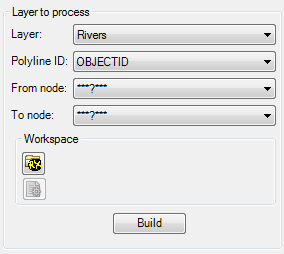 •Once you have set the river network workspace folder you can click on the BUILD button. RivEX will then extract out the nodes of the network give each an unique ID number and write this back to the river network as the new FROM and TO node fields. RivEX then constructs the topology dictionaries it uses to process the network based upon the new node ID's. This process can take many minutes if the network is large (>500,000 polylines).